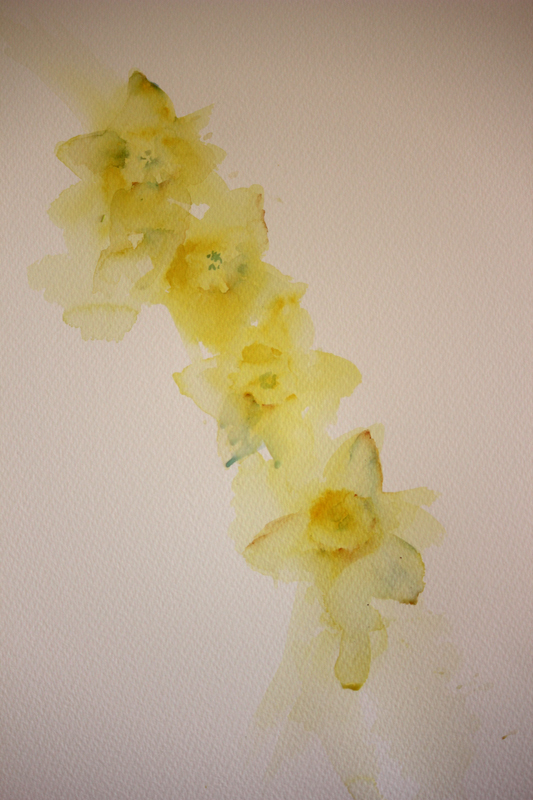 Daffodils are hard to paint so many people have told me but I love painting them. Maybe its' because I am from Wales and they are the Welsh National Flower. I grew up surrounded by them every spring and their gorgeous bright yellow hues would always make me feel instantly cheerful. But going back to those dreaded words. Isn't everything hard to paint when we first take up painting? Especially as adults. Ask a child to paint anything and it never occurs to them that they can't, they just do it and love creating. We need to completely lose the fear of approaching new subjects. 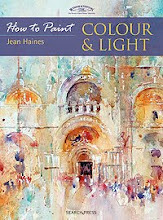 In fact I strongly believe that painting subjects that we do find difficult , often and regularly, improves our skill as artists. 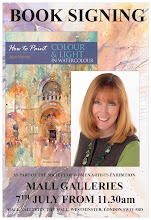 And so what if your painting goes in the bin ( trash can to my American friends!) . It is only by attempting a difficult task that the task in hand can be overcome and seen as being easier. The more you practise the less daunting the task becomes. In fact, over time, it can become something that no longer holds fear. I love a challenge. I love painting things that are new to me and I love painting things that I am familiar with. Like daffodils. I paint them every year but each time I do I attempt to improve on the ones I painted the year before. 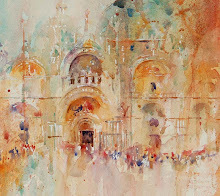 I am on a journey in art, learning and loving the road every step of the way. 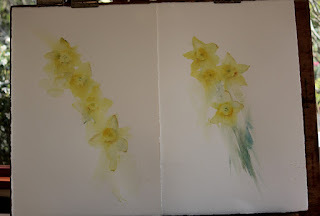 So here I am in 2019 painting my first daffodils of the year and I am so happy. I am aiming to keep the petals papery thin and delicate. Here are two paintings as works in progress side by side on my easel. 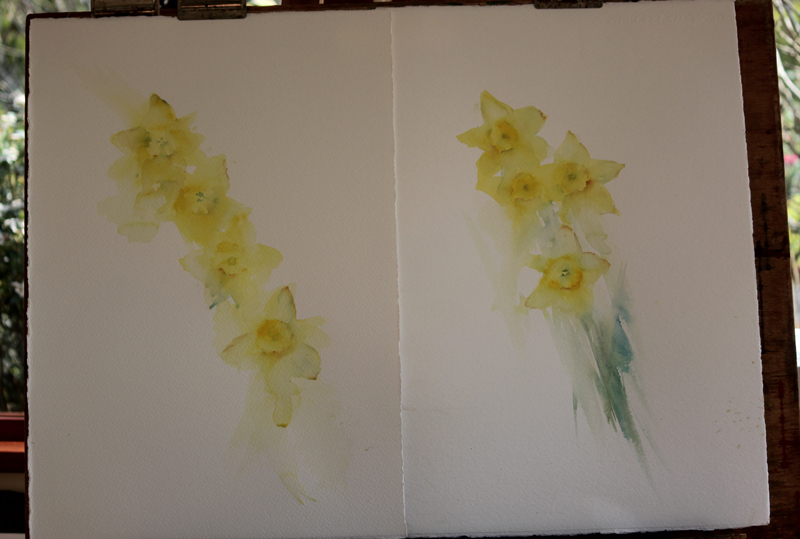 Two daffodil paintings, each guiding me on what to add next on the other.. I usually work in threes, as in three paintings being on the go at any one time. I find I learn from each. Above the painting on the right was my first daffodil piece, the second seen on the left to me is far better. I can see it needs detail but the start is softer because I was more relaxed on the second piece having got into the " mood" or quiet painting zone from warming up on the first painting. This happens. 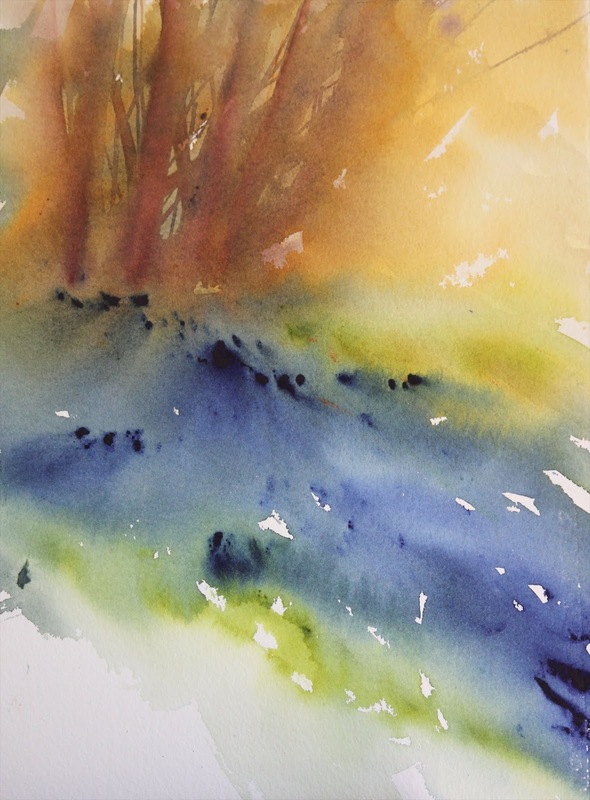 I often need to get my mind calm to really create something beautiful and with such a busy life sometimes I need to get everything out of my system on the first piece to really get stuck into my work. I'm finding Daniel Smith Azo Yellow perfect as a shade for painting these spring flowers. It is'vibrant, can be used translucently and looks gorgeous in sunlight too, just like the real flowers. 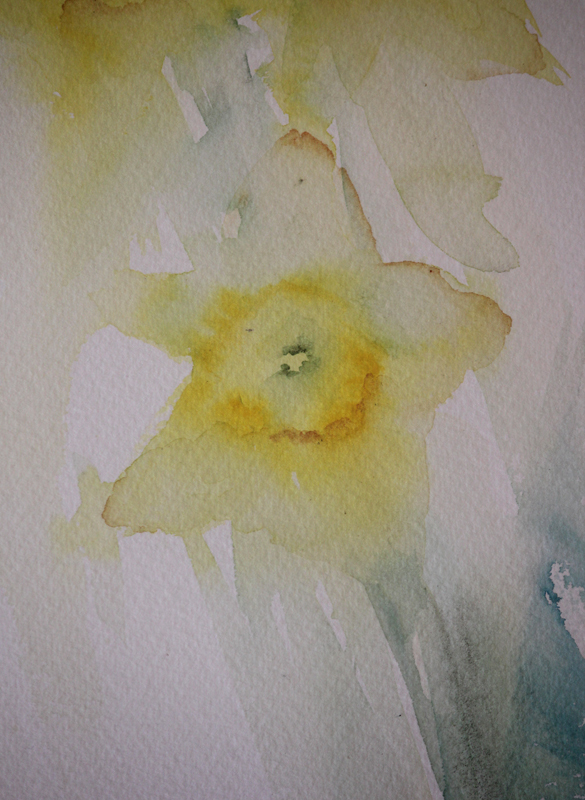 Seen below is a close up of one of the daffodils with detail beginning to be added. 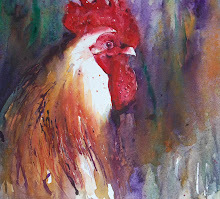 1) Never be put off painting a subject, new challenges stretch us and improve our observation and painting skills. 2) Try painting a rough study for fun before attempting a more serious piece as this helps us get into a great quiet painting zone. 4) Paint from life as much as possible! I see blues, violets and golds in each petal when I study a real daffodil flower and yet when I look quickly at them I only see bright yellow! 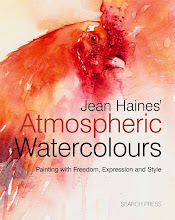 Have fun, relax and enjoy painting. 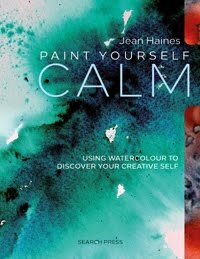 Otherwise your painting time can become stressful which to me defeats the whole point of painting! Seeing the Light , Paint Yourself Positive. I am back! 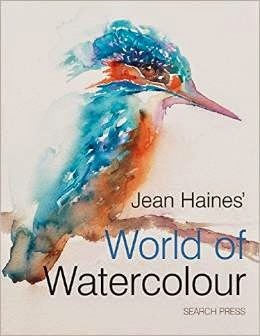 Watch out for the limited edition hardback copy. 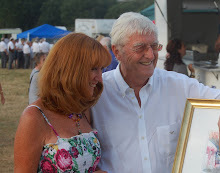 Well that wasn't the way I expected to start 2019 but here I am at last back writing on my blog and now I feel as though I will never catch up as I have so much to share but I have not been able to get on my blog until today. Firstly. My Health. I am now only seeing one specialist, the cardiologist and I have been wearing a monitor that is directly linked to the hospital in case of any more " hiccups". I'm glad to say there has only been a small blip and so far I feel much better. I am completely rested because we went to St Lucia for a two week break , my specialist thought it would be a good move for me to rest in the sun and I feel brilliant again. But not quite up to teaching just yet. Small steps! Now I must say the biggest thank you to everyone who has been so kind writing to me and replying here, concerned about me and how I am doing. You really made such a huge difference to me. Hearing everyone telling me to take it easy helped so much. I genuinely was so heartbroken to have had to cancel my tour and that added stress on top of my feeling unwell. I seriously hate letting anyone down. I have been sensible and cleared my tour diary for this year. I think its' wiser to get better to a point of being 100% well enough to give my all when I teach, as I always do. I can't give workshops that are not 100% full of energising tips ans ideas. Its impossible for me to do anything by half measures and I have a very high teaching standard ethos that I love working to. 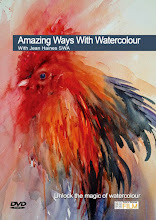 So I will work on a schedule for 2020 that is really special full of new colours, techniques and ways to be inspired by working in watercolour. News o fthese wil be shared later this year. The other thing that has helped me so much is reading my new book. "Paint Yourself Positive" launching this year. I had no idea when I wrote it that I would be the one needing it. I have had to think positively to get through the ups and downs of the last few months. I have had to believe that nothing serious was wrong with me and that I will be back teaching in the future. This is simply a temporary blip and it is giving me the much needed time to work on a completely new workshop programme. Don't worry, it won't be chnaged in format but it will be even better. I have thrived on hearing artists on my courses telling me they have never felt so stimulated in all their lives. Its' been so much fun that I intend to continue. Well I must share photos but we have two new members of our family. Bentley and Teddy, two tiny puppies who are growing every day. They are Australian labradoodles and are so good for my soul. I laugh each day watching their antics and I have no end of people asking to puppy sit if I travel That won't be for a little while but they will be in safe hands when I do. 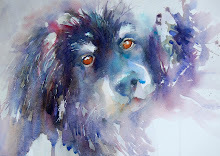 So, now back to painting and wow how can I share with so much to choose from. I will be back on my blog regularly from here in so please watch this space and thank you so much for waiting for me to return!